Does your family ski? 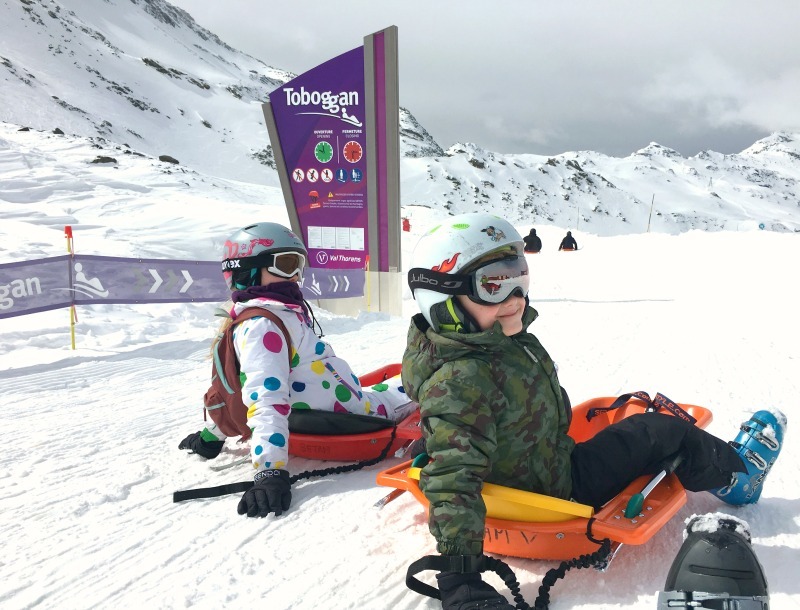 Whether you’re seasoned skiers, or tempted to give skiing a go for the first time with your kids, Helen gives you the lowdown on why Val Thorens, in the Savoie region of France, could be a great choice for you. The resort centre: Val Thorens is still a big resort, but it felt much less ‘concrete’ than I’d remembered it, with the larger blocks lower down (seriously impressive in their facilities – see our review of self-catering residences Le Hameau du Kashmir) giving way to small restaurants and attractive chalet-style buildings the nearer we got to the slopes.In fact, the centre of the resort is a cluster of restaurants grouped around the beginner’s slopes, and that set-up makes the whole resort feel informal and easy to navigate. With short beginner runs leading down to the ski school area, it felt so safe that we felt happy sitting on the terrace of a bar with our coffees while the children practiced their turns. The lift system: SETAM operate the lifts in Val Thorens, and it’s clear that a lot of investment has been put into making sure they’re fast, and that queues are kept to a minimum. In fact, we never queued for more than a few minutes, which is some achievement during the Easter holidays. It’s so important to keep waiting around to a minimum when you’re skiing with children, so this was a huge plus for us. The resort also has several magic carpet lifts – basically covered conveyor belts which the kids loved, and meant they were able to safely get back up the beginner slopes without our supervision. The pistes: Val Thorens is probably one of the best resorts for intermediate and beginner skiers. With the beginner slopes and ski schools all in the centre, children will never have that moment of panic when they realise that they have to get down a more difficult slope at the end of the day. They’re already in town, right next to the waffle hut. Once they progress to intermediate level, there is a huge range of easy wide pistes suitable for developing skiers to practice their skills. Have a look at our Val Thorens piste guide for more detail. The Fun slopes: As well as a brilliant range of intermediate terrain, the Val Thorens planners made sure to inject some fun. 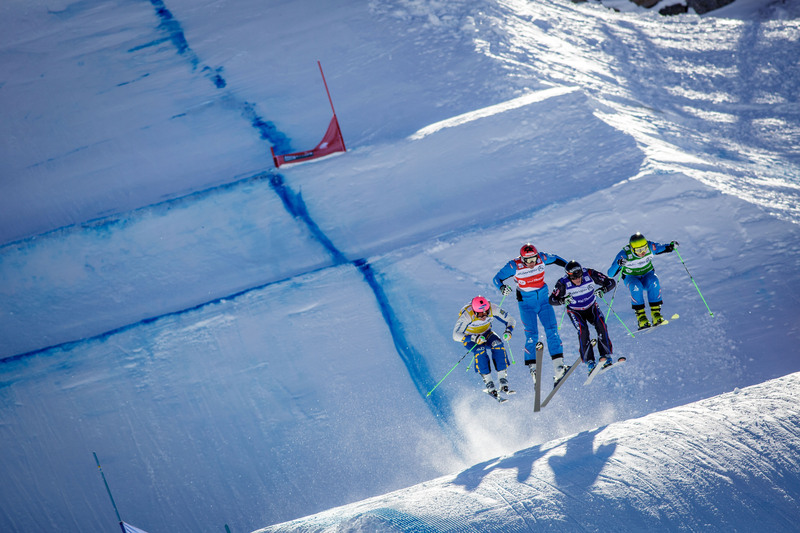 From the 900 metre fun slope full of tunnels and cartoon hands to high five along the way, to the more extreme – but still completely doable Fight Ski Club, where you compete to beat the time of local legend Jean Frédérique Chapuis, there’s diversion and innovation for all the family to try out something new. Our kids loved the fun slope, and were keen to try the snow park until they watched their dad having a comical altercation with a metal rail whilst trying to do tricks. The Luge: the Val Thorens Luge is quite possibly the most fun you can have without skis or a snowboard. We’d pitched up expecting a bit of a sledging ride, but what we got was 6 kilometres of thrills (and a fair few spills) as we twisted and dropped our way hilariously down the longest toboggan run in Europe. You’ll need helmets for this one, and the friendly staff at the rental chalet will provide that, along with a special toboggan – it had brakes; it took us a while to figure out how they worked! Children have to be over 5, and under 10’s need to ride with an adult. You can even book to do the Luge at night, ending at the chalet with cheese and mulled wine. I might go back without the kids for that one! The thrills: though it’s an intermediate resort, there are plenty of opportunities for thrills if you have more advanced skiers with you. I’m not interested in speed, preferring to practice my technique, but I know plenty of snow fans who are all about the rush of air. In fact, there were quite a few speed freaks on the pistes, which did occasionally unnerve me, but the Val Thorens team are working on policing the slopes to penalise people who don’t ski in control on the main slopes. In the meantime, there’s plenty of space for speed on the Fight Ski Club run, where speed is the actual goal. 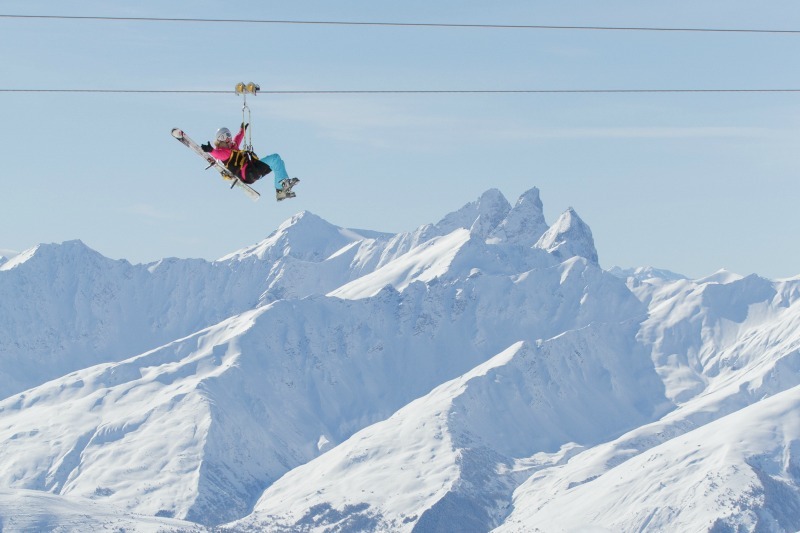 And if you need more adrenaline, you can brave the Tyrolienne, a 1300 metre high zip wire. Simply strap your skis to your back, and let the wire glide you from one mountain to another at 100 kilometres per hour. The ride costs €50, and is subject to weather conditions, so check it’s open before you head up the mountain. The variety: when they’ve got the ski bug, kids will happily ski all day, but every now and then they like to shake things up with a change of scenery. As well as all the pistes, the fun slopes, and the snow parks, there are lots of other activities to do in the snow. The Airbag caused much fascination for my two as we watched novice jumpers and would-be freestyle snowboarders shoot into the air to land safely on a giant air-filled cushion. I know it won’t be long before they’re begging me to do it, though I’ll probably opt for the slightly more sedate option of landing on the airbag via giant rubber ring the Airtubby! There’s also a mini slalom for the kids to practice their turns and their speed, which mine insisted on revisiting every afternoon. The ski schools: as you’d expect from a big resort, there is no shortage of decent instruction. We used the École du Ski Française (ESF), but Val Thorens is home to several ski schools, all with their own specialities. My husband took a private lesson with a lovely instructor who told him all about the resort as she worked on perfecting his carving turns. In the meantime, I lurked to watch the kids have the most fun ever as they gained confidence in the ESF ‘garden’ of tunnels, gadgets and bridges, before heading off to practice specific moves to help them with their technique on the slopes. The food: Val Thorens is in the Savoie region of France, and that means cheese. Fondues, raclettes, and tartiflette, there seems no end to what magic the locals can work with cheese. Kids are usually pretty happy with cheese, and mine are no exception, so we dug in most days to plates of potato, pasta or bread with various cheesy accompaniments. That said, you can’t afford to miss the amazing pizzas at La Maison , steak at Le Caribou on the piste or Steak Club in town, or the waffles whose aroma drifts compellingly across the slopes at the end of the day. There were plenty of kids menus, but we found most restaurants were prepared to make smaller versions of dishes on the main menu, and didn’t bat an eyelid at two children who insisted that they would share a côte de boeuf! Have a look at our post on the variety of places to eat in Val Thorens. The non-skiing activities: We were lucky enough to have a lovely pool in our apartment complex, as well as a games room, but the advantage of being in a ski resort as big as Val Thorens is that there are plenty of public facilities provided by the town. There’s a big commercial centre with everything you’d need if you’re self catering, and there you will also find a sports centre and aqua spa. The leisure pool has fun water jets for kids to play in, and when they’re bored with swimming they can play on trampolines, inflatable castles and in ball pools. Older kids can play all sorts of sports there, or use the bowling alley, so even if you’re not a skier, there’s still plenty to do. You can also go ice-skating, dog-sledding, and even ice-diving at times during the winter season. I didn’t find time to treat myself to a spa treatment, but the spa looked lovely, and it would definitely be on my list in a snowstorm! 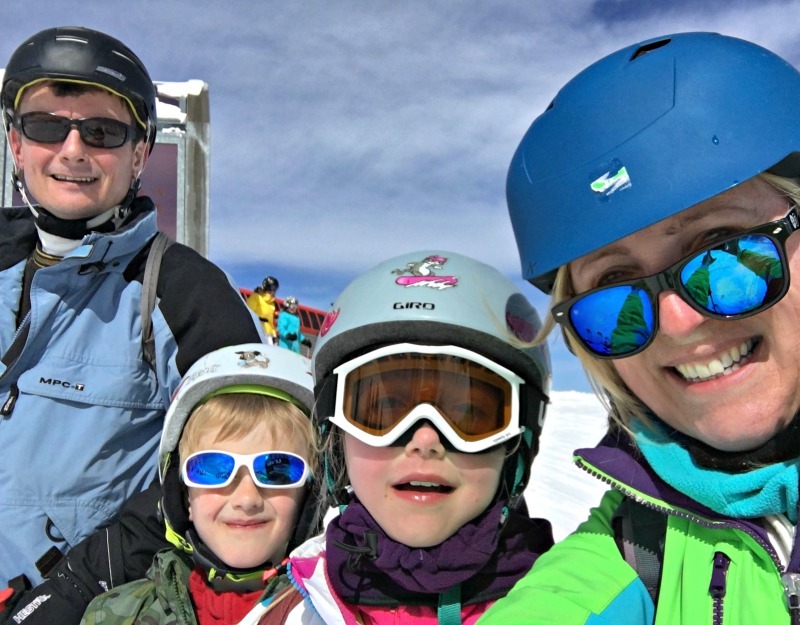 We had a fabulous week, were lucky with the weather and the snow conditions over Easter, and will definitely add Val Thorens to our list of favourite ski resorts while we’re skiing with the children. As one of the highest resorts in Europe, they have a snow guarantee, which means it’s very unlikely you’ll ever be unable to ski, right from Christmas through to the end of the Easter break. There’s a huge range of accommodation to suit all needs and budgets, and it’s actually very easy to drive to the French Alps, which makes for an even more flexible holiday. Definitely recommended for families. 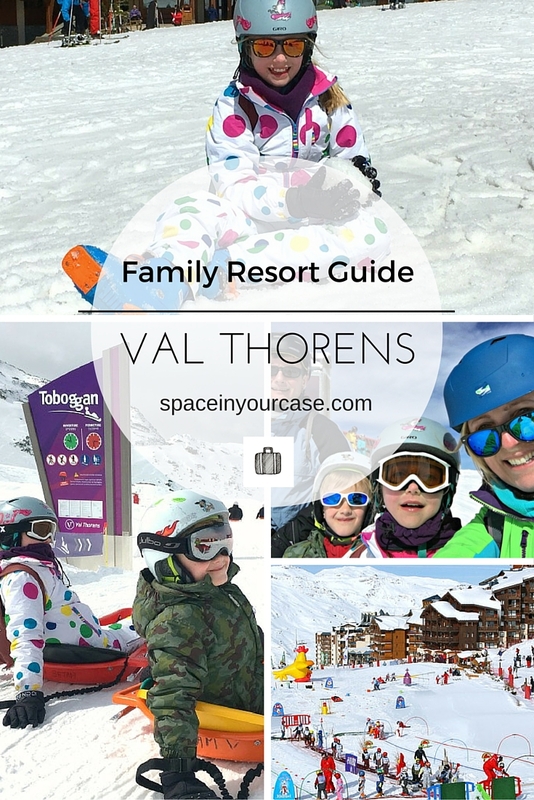 Do you have any tips on skiing as a family in Val Thorens? Let us know in the comments section below. Helen and her family were guests of Erna Low and the Val Thorens tourist board. Their lessons were provided by the ESF ski school.